Did you know that, right now as you read this, you hold in your hand an ancient tool for healing and awakening? Well, not exactly in your hand… The tool is your hand itself! A “Mudra” is a hand position which will create a certain effect on the nervous system, emotions, and mind - yoga for your hands! Our hands don’t just act, they’re also energy maps of the many levels of our consciousness. Putting our fingers and hands in certain relationships with each other and the rest of our body can have a profound effect on our physical and energetic systems and affect our state of being. Standing up proud with a big grin can put us in a confident and happy mood, even if we have to fake it for a minute or two. Mudras are no different, and have the added benefit of being stealthy – you can do one right now and no one will even notice! Try this: curl your fingers around your thumb into a fist. Do it on both hands while you read this. This hand position is called “Adi (first) Mudra (seal)” and is how babies hold their hands in the womb. Do you happen to notice a subtle feeling of security and calm? Maybe some warmth in your heart? You now have a simple tool you can use while public speaking, receiving a performance review at work, engaged in a difficult conversation, or anytime you might feel less than safe and relaxed. We chose a specific mudra for each flavor of SOMA, a simple practice that can help elevate your experience. At SOMA, we put lots of thought and effort into all the details that go into making great probiotic drinks. You can increase their effectiveness by using intention when you enjoy them, and with deep breaths and mudras. We hope you find that SOMA Kombucha, Jun, and Rii help you show up more fully for yourself, and for the people and purposes that make you feel the most alive. Place your palms together in front of your heart. This mudra connects both sides of the brain and body and brings balance to the nervous system. Amp it up by rubbing the hands vigorously for a minute or two. This mudra can also be done with great precision. We find that trying to connect every knuckle, bone, and cell in the hand with its mirror in the other hand simultaneously expands awareness. Actively pressing the hands into each other with the shoulders relaxed scoops the shoulder blades forward, lifting and offering the heart to the thumbs and the broadcasting antennae of the fingers. This mudra inspires purity and perseverance by representing the lotus flower floating above the muddy waters of desire, fear, and attachment. But a mudra is not just a symbol – it completes circuits of energy in the body like flipping a light switch to bring clarity to a deeper experience of yourself. Give it a try and see if Padma Mudra connects you to the natural beauty of your heart and calms your mind. This mudra, when placed in front of the heart, has a grounding yet uplifting effect – an adult version of the Adi Mudra mentioned above. Try holding this mudra in front of your heart and breathing deeply for 3-11 minutes and notice if you feel like a better version of yourself afterword. Make “OK” symbols and interlock the “O”s, other three fingers touch opposite tips. This mudra promotes stability and centeredness. It’s normally pointed upwards, but we find that pointing it down increases the effect. This mudra is great for relieving tension in the body, especially the head. It’s prescribed in Ayurveda (traditional Indian medicine) for migraines, and can relax the brow and forehead, often strained from technology and trying to lean forward into the pace of the modern world. Touch the tip of the thumb to the tips of the index and middle fingers. Put your ring fingertip into your palm then try to stretch your pinkie up. Don’t strain, let the mudra do the work! Do this with both hands, if sitting place the backs of the hands on the knees, and bring awareness to releasing tension from all around the outside of the head to the center of your brain. There you’ll find the pineal gland the source of soma, the Sanskrit name for a compound that’s secreted during deep mediation, blissful states, and death. This is the inspiration for SOMA Kombucha, the name of a company started by accident when founder Jean-Pierre starting offering his family recipe kombucha and jun to his yoga students after class. Hold this mudra and breathe deeply or try it with a little Breath of Fire – in Sanskrit Khapalbhati, or “Skull-Shining Breath”, and radiate! For women, interlace the fingers with the right little finger on the bottom. Place the right thumb in the webbing between the thumb and index finger of the left hand. The left thumb presses the fleshy mound at the base of the right thumb. For men, the thumb positions are reversed and the left little finger goes on the bottom. Then stretch your index finger up up up! By itself, the Venus Lock Mudra increases our ability to concentrate. We can concentrate our energy a little bit to focus on a thought or problem, or concentrate it a lot of bit to transform lower desires into higher intentions. Venus Lock helps us transform fear into an opportunity for self-discovery and growth, undirected sexual energy into creative force, and anger into the power for change. BUT Venus Lock also a part of one of our very favorite yoga practices: the deceptively simple Sat Kriya – the “Everything Meditation”. The practice of Sat Kriya is said to give all the benefits of Kundalini Yoga (a very powerful but simple form of yoga that includes physical exercises, meditation, and chanting) in just a few minutes a day. We meditate in our brewery every morning, and do Sat Kriya for months at a time - it just gets better and better. Shiva is the energy of destruction. Linga is derived from li, meaning "to dissolve," and gam, meaning "to move on”. To use Shiva Linga Mudra, keep the left hand at abdomen level and in a bowl shape. Let the fingers of the left hand stay together. Making a fist, place the right palm over the left palm. The thumb of the right hand should be extended upward. Hold this mudra in your lap and breathe deeply until you feel energized, balanced, confident, and the resolve to make a needed change in your thinking or actions! 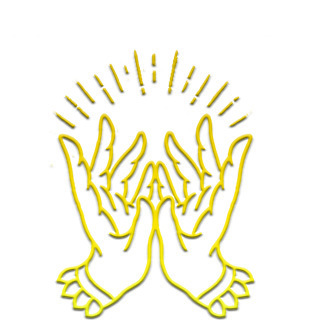 Buddhi Mudra is used to increase the power of perception and intuition. It’s also known as “the seal of mental clarity and clear communication". The little finger represents water and communication; when the pinkie and thumb are placed together it is meant to encourage the self-awareness that leads to clear and open communication. Buddhi Mudra stimulates intuition and connects the conscious to the subconscious. Try it when you’re trying to remember and understand your dreams. This mudra’s function is to decrease inertia and increase vitality by creating heat in the body. It does this is by increasing your metabolism, and is often used effectively for weight loss! The most well-known mudra is actually the "mudra of knowledge"! It’s the most common hand position used in meditation and yoga because it’s of all-around benefit and can be used to focus the mind in any free-hand yoga position, under the table while expressing your idea in a board meeting, and during the deepest meditative states. In fact, the hands will sometimes effortlessly find this position during meditation, as the nervous system completes the circuit of subtly ecstatic energy – bringing us into our natural peaceful, loving, and blissful state. It can also be used when holding the handle of a bottle of SOMA, celebrating how far you’ve come and all the tools you’re born with that help you dive into the mystery and miracle of this life.